Based on the Turing architecture, the EVGA GeForce RTX 2070 XC ULTRA GAMING Graphics Card brings the power of real-time ray tracing and AI to your PC games. It also features enhanced technologies to improve the performance of VR applications, including Variable Rate Shading, Multi-View Rendering, and VRWorks Audio. Real-Time Ray Tracing The NVIDIA GeForce RTX platform enables real-time ray tracing of objects and environments with physically accurate shadows, reflections, refractions, and global illumination. The RTX 2070 features 6 GigaRays per second and up to 42T RTX-OPS*. Box Dimensions (LxWxH) 14.7 x 9.3 x 4.7"
GeForce RTX 2070 XC ULTRA GAMING Graphics Card is rated 5.0 out of 5 by 3. Rated 5 out of 5 by Gladiuz from Aussie Buyer. Would buy again. This card is great np at all. I bought this from Australia it was $200-$300 Cheaper even with postage. I have bought many things from B&H with nps. Highly recommend. Rated 5 out of 5 by Lap Man from Good performance My friend loves it so much that it can have high performance with play games such as Witch 3, Battlefield V.
what is the difference between this card and the evga 2070 xc? I have the EVGA GTX 1070 FTW edition, the best of the GTX 1070 (non-Ti) series. Running a Samsung UHD UE510 (based on UE590) &amp; through either DP 1.2 or the HDMI 2.0 port. Other specs, delidded i7-4790K &amp; 32GB (8GB x4) GSKILL Trident X (DDR3 2400), EVGA Supernova G2 650W PSU. Is it worth the upgrade to this card? Note that I'm not really a gamer, just like to perform benchmarks to 'show &amp; tell'. Even if this card is more powerful, I fear my monitor may hold me back with it's 60Hz max, although may bring the beast of it out. Should I upgrade to a 2K 144Hz (minimum) monitor if I purchase this card? Evidently, while the 4K monitors are plentiful &amp; low cost, seems that more expensive 2K monitors are the way to go, although in reality, a step down, especially as 8K monitors are on the market. 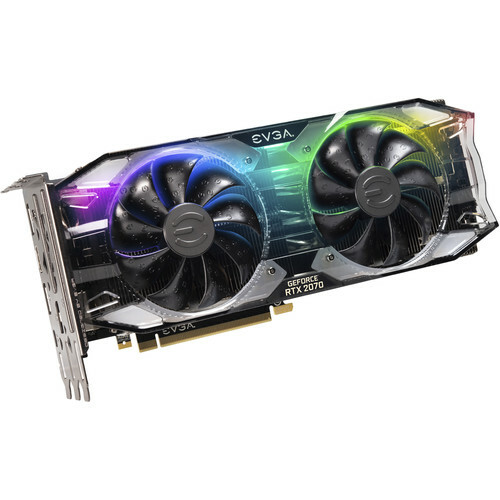 Any thoughts, I don't want to purchase this fantastic GPU in futility.